Zippy is a gorgeous, tri-color English setter male that weighs 50 pounds. He has an even-marked, almost black head with honey brown cheeks. He is easy going with a calm disposition and is quiet and clean in the kennel. Zippy has a ton of natural staunchness, is an instinctive backer and hunts at close-to-moderate range. Zippy moves easily with lofty head and tail carriage. He has been hunted on wild pheasants and ruffed grouse, has traveled and had birds shot over him. He has spent several months training with us. He knows whoa, here, kennel and is ecollar conditioned. He is as nice a hunting dog prospect as can be found and will make an excellent family companion as well. My friend Tony O was picking up his new GSP puppy from Sharp Shooter's Kennel so I went along for the ride. The puppy was nice and friendly. He whined for the first 20-30 minutes of the ride home but that is to be expected. Begin your training with the silhouette. acking, or honoring, is the icing on the cake for the finished dog. The sight of one dog backing another in the field is right up there on the list of images that will take your breath away. Backing happens when hunting two or more well-trained dogs together. When one of the dogs gets a bird scent and points, the backing dog—as he comes toward the dog that is pointing—stops immediately and points the other dog. When the second dog sees the first dog on point, he should stop and “honor” the other dog’s point, whether or not he himself has made scent. Teaching your (almost) finished dog to back can be a fun exercise. Many dogs are natural backers, while some will have to be taught. But even a natural backer will need extra training to remain steady throughout the scenario of watching the flush, shot, and retrieve handled by another dog. This is a lot to ask of him. We are aiming to make the dog a “gentleman” hunter—instilling manners and reliability in all situations. To begin, you’ll need birds, a field to work in, your blank gun, and a helper. Initially, we use a plywood pointing dog silhouette for this training. You can get the less-expensive “manual” kind (with a metal stake attached to it that you push into the ground), or you can purchase one that operates remotely. Remote bird launchers can also be used (eliminating the need for a helper in the early stages of training). Using either the manual or remote silhouette, stake or set it out in an area that is concealed – behind a pile of brush or stand of trees – from the main part of your training field. Plant a bird about 15 feet from the silhouette, which should be facing in the direction of the bird, just as a dog would normally be if pointing it. Heel your dog away from this area and have the helper lay the silhouette on the ground out of sight. Never let your dog run over to or sniff the silhouette. Always keep him at a distance during these exercises. Take him out of the field for the day and let him think about this new phase of training. Repeat this exercise several times a week, varying the locations a bit, until he stops on his own when he sees the silhouette and remains calm and reliably steady while the bird is flushed and you shoot. You can also intersperse this training with regular training sessions where you don’t have the silhouette in the field. We don’t want to pattern-train him; we want to keep him on his toes. Only work with another well-trained finished dog. Next, you can move on to using a live dog for this exercise. Plant a bird in the field and have your helper work the first dog into the bird before you come into the field. Give the first dog time to go on point and then bring your dog into the area. If all goes well, your dog should back the other dog and remain steady through the flush and shot. The helper should keep the other dog steady during this time as well. Remember that your goal is a mannerly finished dog. Don’t be surprised if your dog fails to back the live dog at first. Just because he’s honored the silhouette is no guarantee he’ll honor the live dog. Keep at the exercises until he backs at first sight of the other dog. Some dogs seem to have innate backing instinct and some will take longer to catch on, so be patient, persistent and firm. You’re also working to instill control quietly—as time goes on, you want your dog to back on sight without you using your voice or giving a signal. When working on backing exercises, you’ll always want to work with another well-trained finished dog. All of us have hunted in situations where dogs have failed to back and have charged in to either steal another dog’s point or even flush the bird out from under the other dog. We don’t want these types of scenarios in college-level work. We use skilled dogs with superb manners as we develop our student. There should be no aggression or free-for-alls with the honoring exercises. A great job of honoring by the dog on the far left. Once your dog is backing consistently and remaining steady to shot, it’s time to introduce the final element: keeping him steady and honoring while the other dog makes the retrieve. Next time you take your dog to the field for the backing exercise, have your helper/handler shoot the flushed bird and then send his dog for the retrieve on command. Up until now, you’ve been working with flyaway birds. Your dog will be sorely tested to remain steady while the other dog heads out for a retrieve. But if you’ve laid your groundwork well on the “Steady to Wing and Shot” phase of training, this shouldn’t be too difficult. After the other dog has retrieved, you can release both dogs and let them have a little fun run to ease any tensions. When your dog understands and performs the backing exercise well, you can change up the scenario and occasionally let your dog be the “first dog.” This way he’ll have the reward of a retrieve for all his hard work. Developing a dog that can truly be called a finished dog takes a lot of time, patience, and effort but the rewards are unmatched. Whether you go on to compete in field events to show off his skills, or simply enjoy the pleasure of hunting with a well-trained, mannerly dog, you can be proud of your accomplishment! Pointing Dog Pointers features monthly training tips by Bob and Jody Iler, who own Green Valley Kennels in Dubuque, Iowa. Bob and Jody have trained pointing dogs for over 35 years and have written many articles for Pointing Dog Journal. You can look up their website at www.greenvalleykennels.com. 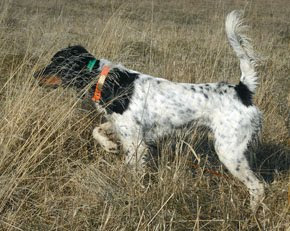 NorthWoods Bird Dogs has a number of good looking litters coming this spring. I am biased towards the Blue Ghost x Blue Riptide litter as Blue Riptide is a son of my dog Blue Blossom ( Tina ). Jerry also offers a full range of dog training programs. Ronnie Smith of the Famed Trialing and Training Smith Family is offering Dog Trainer Apprenticeships through his Ronnie Smith Kennels. Our goal is to effectively convey our expertise and enthusiasm in training exceptional bird dogs to anyone wanting to improve their training skills. Unique in its structure, this program immerses its participants in the day to day activities of a professional training facility. It is an intense work program with the apprentices getting as much benefit out of the experience as the amount of effort they put in to it. Each level of certification consists of a four week apprenticeship at Ronnie Smith Kennels in Big Cabin, Oklahoma. The apprentices will have the opportunity to utilize the Ronnie Smith Kennels facilities and equipment to gain a working knowledge of a professional training facility. Each apprentice will have the opportunity to work with a large number of dogs with different personalities and breeds. Apprentices have the opportunity to learn to deal with a wide variety of training issues and learn the proper use of an e-collar. The Apprentices deal frequently with clientele and become accustomed to teaching the training process to others. Achievement of a Huntsmith Certification allows the apprentice to participate in Huntsmith activities as a certified member.